Professional Lab Custom Molded Motorcycle Ear Plugs are the very best motorcycle ear plugs you can get. These custom motorcycle ear plugs require you to mail us impressions of your ears. Ear impressions are easy to get: opt for the Do-It-Yourself Impression Kit with your purchase of any pair of professional lab custom ear plugs, and you can make your own ear impressions at home. Alternatively, you may visit your local audiologist to have ear impressions made. Here, you will find a choice selection of professional lab custom molded ear plugs designed especially for bikers. 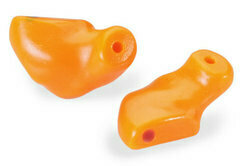 These full-custom motorcycle ear plugs feature a low profile fit for wear with or without a helmet, and many also include a built-in acoustic filter to help eliminate the loud and irritating sounds (such as wind noise) that can damage your hearing while you ride, while still letting you hear safe sounds like voices or traffic signals clearly.